More often than not, my clients and athletes wish to obtain every performance attribute all at once. They want endurance, strength, power, hypertrophy and fat loss, simultaneously. 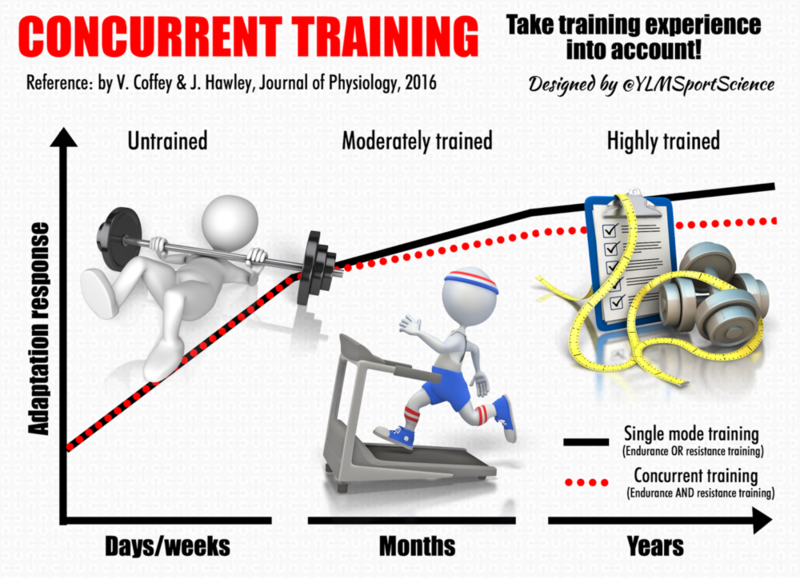 Unfortunately, concurrent training does not yield optimal results in each area, unless you are completely novice and or recovering from serious injury. The body cannot concurrently train to squat as much weight as possible while training for a marathon because of the competing metabolic and hormonal pathways. Training to squat as much weight as possible whilst concurrently training for a marathon simply doesn't work. In order to optimize strength, high rates of force development are required as well as greater proportions of Type IIx fibers and higher muscle glycogen stores. These are all blunted when endurance training is performed, which ultimately decreases overall rate of force development, shifts Type IIx fibers towards Type IIa and Type I, and depletes glycogen stores. Done concurrently, endurance training will decrease protein synthesis, and serve as a competing pathway way to strength training during recovery. All of this is only an issue if your goal is to increase strength and optimize performance in sports that require powerful explosive movements. Paradoxically, endurance athletes can benefit from the addition of strength training. Contrary to popular belief, these athletes will not "bulk up" or slow down when adding resistance training to their program due to the mechanisms previously mentioned above. They will benefit from an increase in overall power generating capacity, and rate of force development that is ultimately beneficial. In most cases, however, athletes compete in sports that require high levels of fitness using multiple energy systems. More common are general population clients of mine who are seeking to improve overall health and improve incrementally in all areas of fitness. It must be understood that all of the previously mentioned information above is describing optimal performance in one area at a time. It is possible to improve in multiple areas at once, however, full potential will not be reached in anything specific. If you are seeking to become a more well-rounded individual in regard to your fitness, some general guidelines can be followed to help you maximize your results. First, periodize your programming. What this means is focus on building general endurance and hypertrophy first for a few weeks, then transition into to a strength and power phase. Second, separate your strength and conditioning sessions. If possible do them on completely separate days, but if you must do them on the same day, aim to have at least 6 hours of separation between each. Last, fuel for whatever it is you are about to do or have just completed. Long endurance type training is highly lipolytic, therefore good fats are essential to use for fuel whereas as brief intense weight training or sprints are highly glycolytic. This require glucose and stored muscle glycogen to perform optimally. I hope what you've gained from this article is that fitness attributes are a lot like running a business. You have to decide what it is you'd like to specialize in, and how you will devote your resources to making it happen. In training, you have to also decide what it is you'd like to specialize in, and then make a plan of how you will get there. My goal with this is to help inform you of how to make it possible. Thanks again as always for reading.